Gallery ~ Author: José Díaz ~ Publisher: Davans, 2003 ~ (2P 8+) ~ Find It! 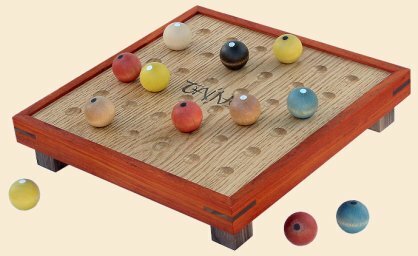 The object of Taíno is to render one's opponent unable to play by skillfully placing one's own wooden spheres on the gameboard so as to make formations of 3, 4, 5, or 6 spheres; thus capturing unplayed opposing spheres, which are then turned over and made into allies. A simpler version of Taíno was played by the author with his Taíno ancestors in the days when television was a luxury.